So, I figured that I would make today's blog about what I do on a typical day here at the kennel. Let's go back to Wednesday. 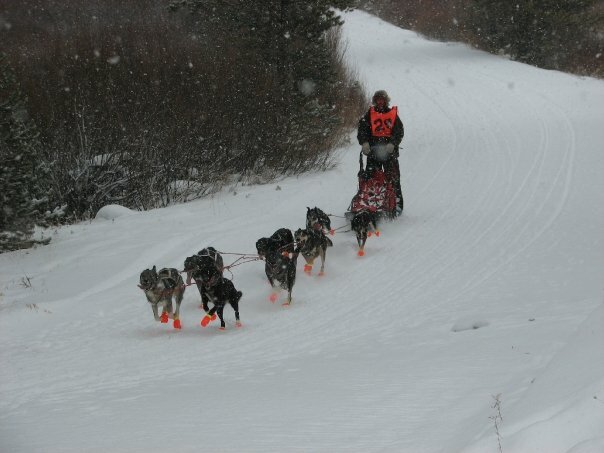 I got up early in the morning and went out to run the sled dog puppies. I individually would harness each puppy to a car tire and run a short distance down our road and back. All the puppies did really, really well! They think it is so much fun to "go play with the tire." After all 8 pups had a turn with the tire, which took about 2 hours, I went back in the house to catch my breath and mix up breakfast for the sled dogs and puppies. 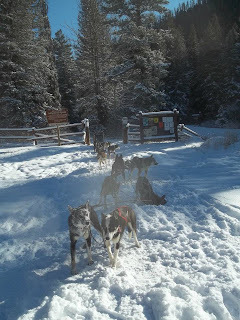 Once I was done mixing up the meat soup and kibble for the sled dogs, I fed the house dogs; Thom, Faith, JB, and CheVelle; then immediately went out to feed the sled dogs. Each dog gets their own helping of meat soup with dry kibble on top. All the adult dogs wait patiently for their breakfast to be served, and my dogs sit, speak, and shake (or some combination thereof) for their meal. The puppies on the other hand, are still learning how to be patient and wait for me to put ALL the food in their dish before inhaling it! After everyone had been served their breakfast, it was time to move on to the dirty work. As can be expected, with a lot of dogs there comes a lot of poo to pick up. Picking up poop is not the funnest chore involved with mushing, but it is a necessary task to maintain a healthy environment. It seems that the times I pick up poop in the dog yard, are the times I do a lot of thinking. This particular time I was thinking of how when I have my cousins over helping pick up poop, they don't see all the poop always. Even though I can see the forgotten feces as clear as day, they honestly did not see it. This discovery led to my conclusion that dog mushers must have some sort of sixth sense, like "poop vision" or something. From years and years of scanning the ground for camouflaged dog droppings, dog mushers must have developed this "poop vision." There is also a fascination among dog mushers with our dog's stools. To the non-dog musher, we would seem totally out of our minds and slightly disturbed, but as it turns out, poop is a very important thing! A bad stool, or a stool not typical to that particular dog, is a great indicator of the dog's overall health. We always want our dogs to be as healthy as can be, so us dog mushers are always studying the feces as we clean them up to be sure our dogs' bodies are functioning properly. Dogs also seem to have "pooping paterns". Mushers know everything about their dogs, for example, my dogs always have their special place where they do their business, these dogs tend to have a more 'organized' personality. By knowing this, I'm able to pinpoint exactly where I need to look to clean up the poop. Some of the dogs aren't as organized and let the poop fall where it may, which reflects on their care-free personalities. I guess you could say that you can tell a lot about a dog by looking at his poop! I then came into the house to eat some lunch, my first meal of the day, and do some school work. I worked on school work until late afternoon when I went out to begin the long process of dumping poop buckets. When I pick up poop in the dog yard, I transport the feces to buckets at the gate of the yard. When all the buckets get filled up, I need to take the buckets to the "poop pile" where the contents of the buckets are disposed of to become new soil. In the summer months I use the 4-wheeler towing a small trailer to transport the buckets, and in the winter I have to carry the buckets by hand. 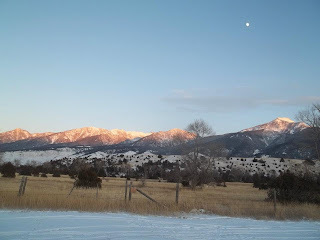 Fortunately, I was able to use the 4-wheeler this particular time, probably the only positive result of our lack of snow. It took 5 trips to get all the buckets dumped, 10 buckets each trip. JB and CheVelle "assisted" with this; however, being herding dogs, all they really did was bark and run circles around the 4-wheeler as I was driving it. By the time I was done with dumping the buckets, it was already totally dark out and it was time to get to the next task. The final chore I had to tackle before feeding the sled dogs dinner, was cleaning the trailer. I had to rake all the old straw out of the crates in the trailer and replenish them with new straw. It is not a difficult task aside from the 3 crates that I have to squeeze into and pull the straw out by hand, but it is messy. By the time I'm finished, I'm covered with straw from head to toe. The last task of the night is feeding the sled dogs dinner. For dinner, the dogs get what we call a "meal". A "meal" is meat, water, and kibble all mixed together. It is like chili for dogs. Once all the dogs are fed, they go to sleep for the night and I retire to the house. Another cool thing is that the dogs say "thank you" after breakfast and dinner. They do this by all howling together after they have finished eating. Just another day at the kennel! click HERE to see a video of the puppies' tire pulling! Last weekend, we had our first race of the season in West Yellowstone, MT! We ran the 8-dog 22mile course and received 6th place out of 16 very competitive teams! 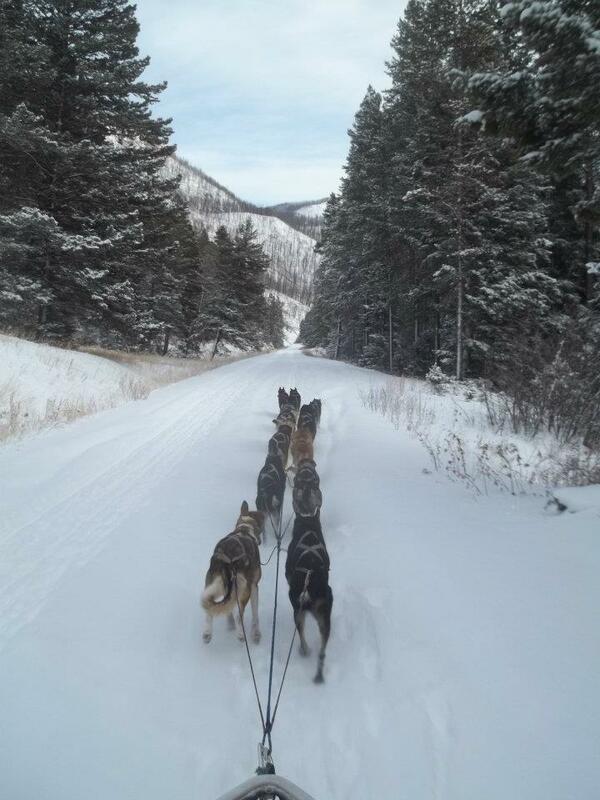 I had Bella and Alice in lead, followed by Otter, Super Cub, Emmett, Jasper, Kaycee and Ra. We completed the trail in about and hour and a half both days, but the team was faster the second day even though we had to pass twice as many teams! The dogs did really super! It was also Bella's and Alice's first race running lead together! It was a very successful weekend and it was fun to see all of my mushing friends again. Dad ran the 10 mile trail after the race on Friday just for fun with Khufu and Cessena in lead, followed by Chewy, Stitch, Eastwood, Bronson, Tut and Newman. 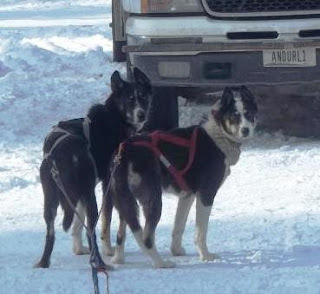 Another exciting part of the weekend was that I found out that I was selected to be sponsored by Manmat Dog Mushing Equipment, so the doggies will be getting some new harnesses, collars, and other goodies! We'll be training today and tomorrow, and then head down to West late Thursday morning. Wish us luck! Here are a couple videos of our fall training this year with the team! click here to see the videos on our Facebook page! Also, follow the team and I on our Facebook page! Click HERE to see more photos from our first sled runs!